A cold night in April finds me in Chicago at the home of Cycle Smithy bike shop owner and bike collector Mark Mattei. The Windy City is still in winter mode. Its snowing lightly, temperatures are in the 20s and frigid gusts squeeze their way through Marks windows, forcing him to crank the heat in his downtown home. But we hardly notice. Its unlikely even a tornado could snap us out of our trance at this point. Moments before, Mark had asked if Id like to see his prize possession. Considering he lives in a three-story thats absolutely stuffed (including the garage and attic) with collectibles, I couldnt imagine what it might be. The James Bond figure set? The 1885 Star highwheel? One of the streamlined tricycles? A motorized skateboard? The one-of-a-kind Condor Moulton dual-suspension mini-wheeled rig from the 1960s? Im shocked when he pulls out an ordinary manila folder. But whats inside mesmerizes us for the next hour, transporting two old-bike junkies to another time, another place: prewar Chicago, when the Schwinn Bicycle Company was run by Frank W. Schwinn, probably the most influential bikemaker ever. The pages are surely priceless. But its not the value that moves Mark and me. By handling Schwinns original works, we might as well be sitting in his office 50 years ago as he penned these notes to his factory charges. The notes might not mean much to the rest of the world. But Mark went into the bike biz with his dad in '74, opening the store just miles from Schwinns Excelsior factory, a Chicago landmark before it was demolished. My connection is a five-year stint working at a Schwinn dealership, building and repairing the machines that Frank so influenced. Is your rusty wreck worth a kings ransom? Probably not. While every bike has value (at least if its ridable), most used bikes such as your old Bridgestone mountain bike or Miyata tourer or the ubiquitous Schwinn Varsity will only fetch pedestrian prices. Usually, this is about $75 to $350 for road bikes, $100 and up for mountain bikes depending on the model. Value improves if you have a deluxe ballon-tire bike, a pre-1925 antique, a Schwinn Sting Ray model or a famous-maker vintage ten-speed  especially if what you have is in good original condition. Of these, antiques, balloon-tire models (boys bikes with horn tanks, fenders, springer forks, lights, chainguards and so on are the most desirable) and Sting Rays are easiest to sell since collectors of these bike are among the most organized. You can determine value to a certain extent by checking prices on bikes by searching for the brand on eBay. Obviously, the true value is only what someone is willing to pay. On a good day you may get a few thousand for a nice highwheel or a sweet Schwinn Black Phantom. But deals like the ones at the recent Schwinn-family auction where a 1969 Orange Krate sold for over $16,000 are rare. Its safe to say that the vast majority of bikes out there arent worth a whole lot. I was in college in New England then, running cross country, touring by bike, partying, scraping by in school. I met my future wife there. They were sweet times. And Schwinns, the bikes, the ads, the parts, the name, will always take me back to that time, the way hearing Roy Orbisons Oh Pretty Woman conjures grammar school. Its these kinds of connections that make objects from the past so powerful and that drive the collecting hobby  be it old bikes or Cabbage Patch dolls. Bike collecting is still primarily an underground hobby; goods and cash changing hands on eBay, at small swap meets and flea markets, alongside major antique auto meets, at the few shops specializing in stuff from the past or via ads run in sporadically published newsletters. And collectors communicate via a neat network of phone and e-mail. Lines went wild in early April of '97, when Jim Dicke, who owns a forklift manufacturing company in New Bremen, Ohio, dropped $500,000 at an auction to purchase 150 bikes that made up the bulk of the Schwinn family collection (theyre now displayed in his museum). There are Japanese collectors who pay thousands for French touring bikes and Americans whod drop ten grand for the right deluxe cruiser from the '30s. But the kind of cash and bulk buying that Dicke exhibited is a first in the tired-two-wheel trade. The hobby and the people in it, can be unpredictable like that. Mark himself is a bit unusual as bike collectors go. Most specialize in one bike type or those from a certain era. But not only does Mark horde all kinds of things (did I mention the Duncan yo-yos, Matchbox cars, dinosaur prints, tank models and cigarette lighters? ), he digs all types of two wheelers from aero racing models to antiques, from folding bikes to tandems. Frankly, hes gone bonkers over them. I should buy a new van, replace the battered siding and roof on my house, but what can I say, Im a sick puppy, I like collecting stuff, he says. More common are collectors who acquire vintage pedalers for a purpose, say to track the history of the bicycle. This is what Carl Burgwardt who ran the now-gone Pedaling History Bicycle Museum in Orchard Park, New York, did. He started collecting after finding a highwheel two decades ago at a country auction. The antique was in pieces and the only thing he knew was that he liked it. To resurrect the machine, Carl tracked down members of The Wheelmen, a club interested in preserving cyclings heritage. Carl began learning about his find and attending vintage-bike meets where The Wheelmen dressed in period costumes and rode their old machines. Fittingly, Carl and his wife Clarice, ran their 7,000-square-foot museum that contained 320-plus bikes and all manner of ephemera that created a timeline of the bicycle and how it changed America, from the circa-1817 Draisienne to the most modern of mountain bikes. Among the more entertaining mounts was an 1881 marine bicycle built by the Portsmouth (NH) Marine Bicycle Company. It sports 22-foot-long pontoons and a pedal-powered propeller with a pitchfork shield to keep out seaweed. Carl thinks it may be the only one in existence. He was equally proud of his American highwheel safeties also from the 1880s. These feature one huge and one tiny wheel and some fascinatingly complicated drivetrains. Seven models were made. He had every one. Clarice enjoyed bringing the history alive as much as Carl did. She held a Victorian tea at the museum. 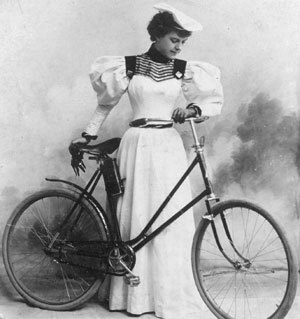 Costumed cycling guests included Susan B. Anthony, womens rights activist: Belva Lockwood, the first female presidential candidate: Elsa Van Bluman, a champion highwheel racer; and Frances Willard, a leader of the womens rights movement in the 1890s. For Chuck and Sherry Schmidt, artists living in South Pasadena, California, racing is the hook. She got the bug after the '84 Olympics and now nabs postcards, photos, advertisements, miniatures, medals, books, programs  anything and everything linked to bike racing. Its the excitement, she says. Her pin collection numbers more than 5,000. Chucks crazy about the bikes themselves. What he finds most desirable is early machines in original condition. He points out, No matter what you do, what you spend, you cant restore originality. Sometimes sprucing up an original bike means a lot of work. Often heavily used and modified, they can be so rusty and so nondescript youd think they belonged in the county dump. But when Chuck finds one he goes to town, spending days scraping off the rust, buffing out the paint, campaigning for parts. He wont quit until its just right with the original water bottles, toe straps, matching pump, bar tape and plugs. Occasionally hell find a gem that only needs a good cleaning such as the '79 Bianchi a guy was trying to trade at L.A. shops. One of the shop employees called Chuck and another racer found a caring home. The bike is dazzling now, easily matching original showroom condition  it was a great buy at $200. Even better is what Chuck does with the bikes when theyre road worthy. Every one gets ridden. And like The Wheelmen, Chuck does it just so, selecting a certain bike and dressing in the appropriate team uniform. The day we rode he looked all the world like Sean Kelly pedaling his full-Mavic Vitus in KAS emblazoned clothing. And he breaks out the woolies for rides on his '54 Bianchi, a replica of the bike on which Fausto Coppi won the '53 world championship road race. And he cant get enough of it. He says each bike has a unique personality, offering a different ride and taking you back to what it was like to race in days gone by. If youre starting to get the idea that these folks are passionate about things vintage, youre starting to understand what bike collecting and collectors are all about. Outsiders think there must be big bucks in it. But what ties the hobby together is far greater than that. Its an all-consuming desire to preserve and experience in some way, that which came before  in some case, to literally turn back the hands of time. You cant put a price on that.